Dr. Mengelkoch received his B.H.S. in Physical Therapy from the University of Florida and has been a practicing Physical Therapist since 1985. 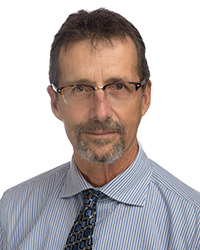 In clinical practice he has specialized in Stage I and II Cardiac Rehabilitation and Pulmonary Rehabilitation, working with patients in intensive care and acute care settings, and patients pre and post heart/lung transplantation. Dr. Mengelkoch received a B.S. in Zoology from Ohio State University, a M.S. in Physical Education from Florida International University, a Ph.D. in Exercise Physiology from the University of Florida and he did a Post-Doctoral Fellowship in the Dept. of Medicine, at the University of Florida. Dr. Mengelkoch is a Professor and started his experience in academic Physical Therapy Programs in 1994. He has previously been a full-time faculty member at Ohio State University, Florida A&M University and the University of South Florida. Currently Dr. Mengelkoch is an Instructor for the Movement Physiology Laboratory Course and Cardiopulmonary Physical Therapy course. Ongoing research involves studies of various populations (amputees, dancers, veterans) with outcomes measuring metabolic energy expenditure, exercise performance, wellness screening and standardized physical functional performance testing.